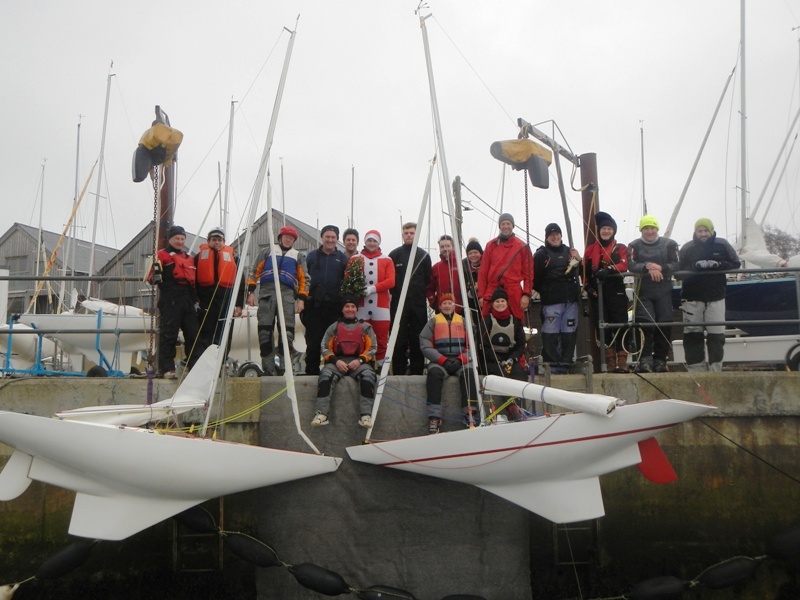 Although not quite as warm as at the beginning of the season back in early October and there was certainly no sunshine, the first day of this year’s Christmas Cracker were certainly not very wintery for the eighteen Illusionists who took to the water in a pleasant F3 WSW breeze and calm conditions in the harbour. After a half an hour postponement waiting for the tide to make so that boats did not run aground on the sandbank in the centre of the harbour, the start of the first race was delayed further with a General Recall after there were just too many boats OCS at the pin end of the line for a fair start. The second start, under Flag U was a close run thing with George Downer pushing his luck with centimeters to spare. 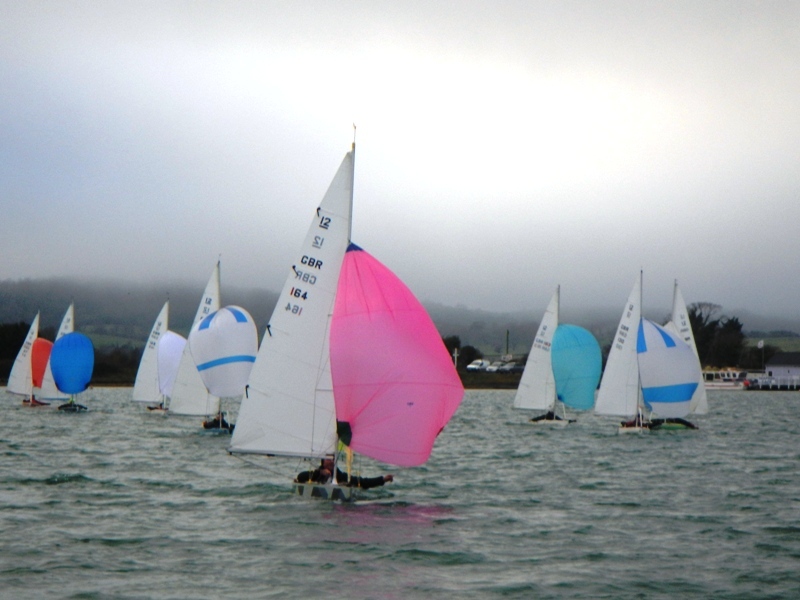 James Meaning was first to round the windward mark with Mark Downer and Bruce Huber in close pursuit. 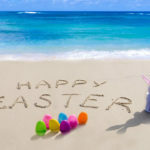 All three spotted that the left hand leeward gate offered a slight advantage and despite best efforts to unseat him from first place, they had to make do with second and third. Bill Daniels, apparently racing in his first Christmas Cracker, was fourth just ahead of George Downer. 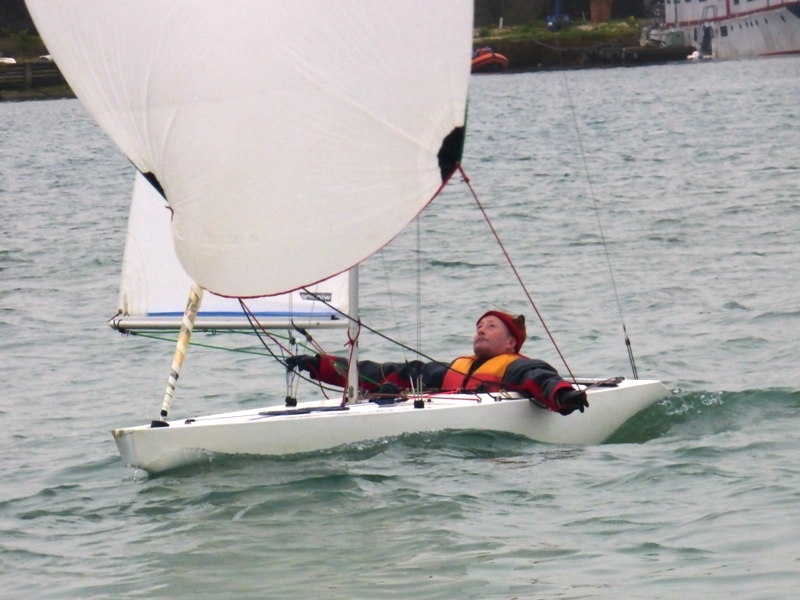 The fleet were much more constrained at the start of the second race, also under Flag U, although with the breeze backing in the final thirty seconds, a number struggled to make the pin – indeed Bruce had to put in a short tack which he just got away with. Mark was first to the windward mark with Bruce, George, Justin Biddle and James not far behind. On the second and third rounds, Mark extended his lead over Bruce and George who had to work hard to maintain their second & third places ahead of James & Justin who finished with only inches between them. Lower down the fleet the racing was just as keen with numerous place changes. And well done to Issie Cobb who had only been in an Illusion once before, who although last in both races, successfully completed them. 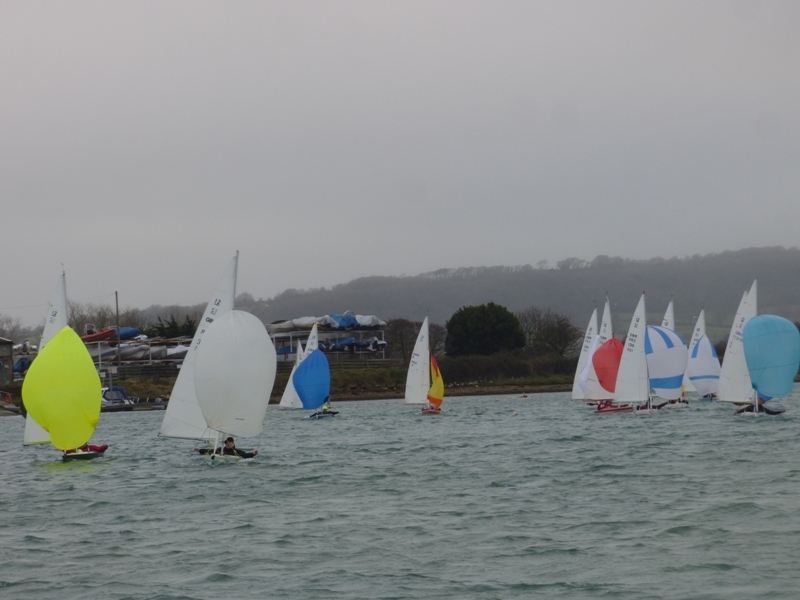 Although a few boats decided to head back to the Illusion Quay, the start of the final race of the day, again started under Flag U was a cracker with everyone close up to the line. Indeed, despite almost perfect timing Bill Daniels’s attempt at a port tack start close to the pin was thwarted and he had to duck the whole fleet. Mark was again first to reach the windward mark with Alastair, Bruce, Justin and Jo Downer in his wake. 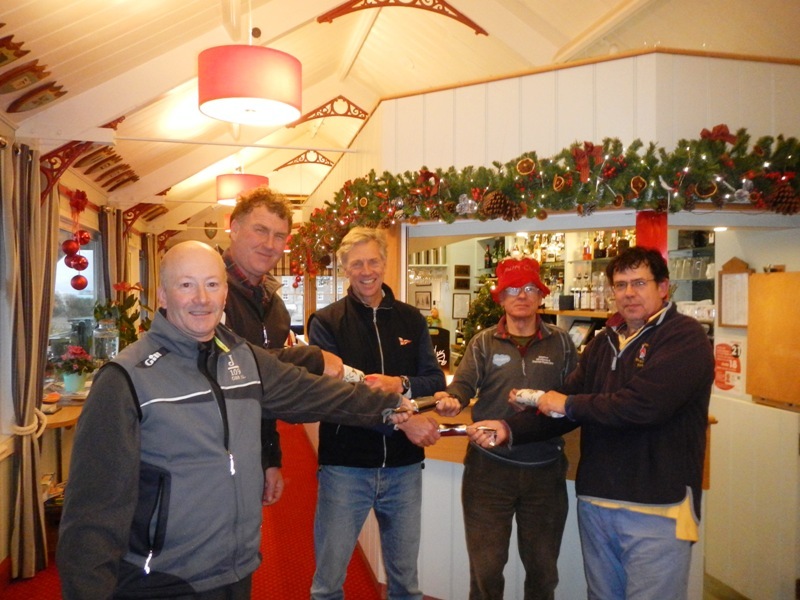 Mark maintained his lead on the second and third rounds with Bruce taking up the chase ahead of James and Alastair. As it was the last race of the day, the Race Officers decided to go for a fourth round which gave Bruce the opportunity to get ahead by a whisker at the top of the course; as they match raced back to the gate for the final time they nearly let James through, however in the end Mark got his nose in front and Bruce managed to hold off James to take second place. Great racing! 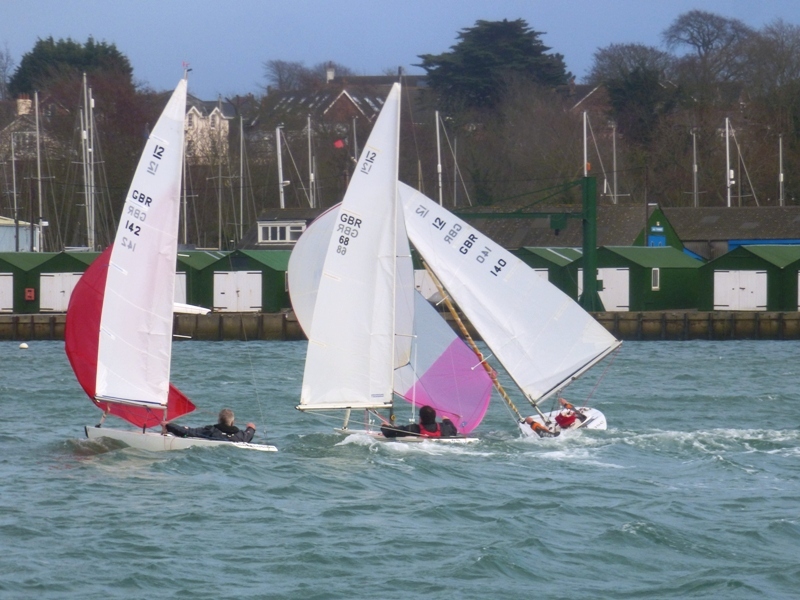 Family commitments reduced the numbers for Sunday to 10 boats, however there were four new entries which therefore brought the total numbers for the two day Regatta to an impressive 22. After a similar delay waiting for the tide as the day before, the first race started in about 14 knots of breeze. 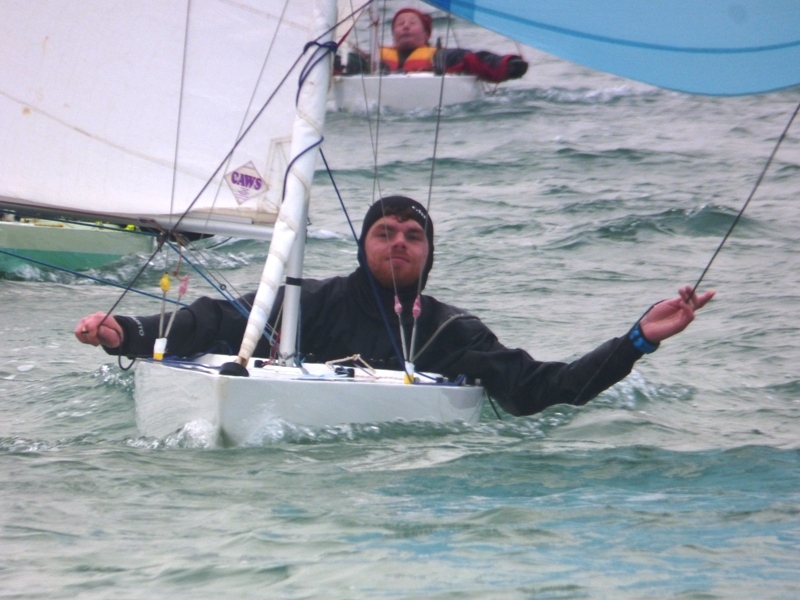 Unusually, Mark Downer was OCS however it did not take him long to clear himself and by the time he reached the windward mark he was in fourth place. First to round was David Peerless just ahead of Bruce Huber and Bill Daniels, however by the time they reached the leeward gate, Bruce had worked himself into the lead. In the second round Mark found the better wind shifts and after some close racing moved up to second ahead of Bill. There was little to separate them as they rounded the leeward gate for the final time, however Bruce was just able to hang on and crossed the finish line a couple of boat lengths ahead. 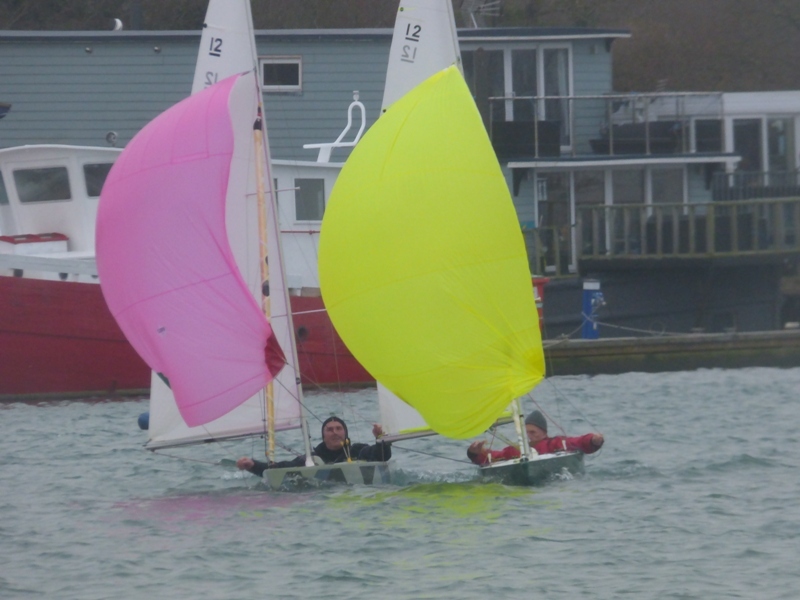 The start of the second race of the day nearly resulted in a General Recall, however it was decided to stick with the Individual Recall and by the process of elimination work out who had been OCS and fortunately all those who were over went back. Mark was first to the windward mark with Bruce close behind, however on the first run Bruce dropped back a bit after he developed a problem with his spinnaker and had to use his genoa for most of the leg. Although he cleverly resolved the problem in time for the second run and was able to reduce a deficit a bit, he had to make do with second ahead, by some way, of Alastair Speare-Cole. Mike Toogood, Bill Daniels and David Peerless meanwhile had a close tussle for the mid-fleet places. 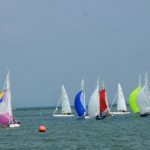 With the breeze gusting 20 knots and the sun trying hard to show itself, the start of the third and final race was close with two boats just over cooking it and having to return. Although David Peerless (despite nearly forgetting to go through the line to start the second round) was with them for most of the first round, Bruce and Mark were out in front throughout and got in a bit more match racing practice. Again it could have gone either way having rounded different leeward gate marks at the same time, but Mark read the finish line bias best and crossed a couple of boat lengths ahead. Quietly minding his own business and keeping out of trouble by sticking with his genoa on the runs, third place went to the Fleet Admiral, Robin Ebsworth. Bill was fourth and Alastair just pipped David. Overall, another one two for Mark and Bruce with Bill in third, just ahead of Alastair. 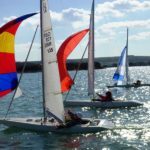 The next Regatta is not until the New Year (Icebreaker – 6th &7th January), however some racing is planned for New Year’s Day (first start 10:00) so look forward to seeing you all.